Que de choses dans un menuet! The course will focus on the minuet, not the standard ballroom couple dance, but rather different unusual minuets of which some are theatrical. During the course, we will also deal with different notation systems. In 1685 or 1686, André Lorin presented a collection of dances to the king. Most of the dances were English country dances, but two of the dances were probably his own choreographies. One of these appears to be a lengthy dance for performance use, and the central section was danced with minuet steps. This dance is the earliest notated minuet, and this will give us an opportunity to look at Lorin’s system of notation and compare it to the contemporary system by Favier. The IHP Tanzmeister 1705 contains a lovely figured minuet called Menuet d’Anjou. It was probably copied from a now lost French source, but Pasch notated it in his own notation system, which provides interesting information about the dance style of the period. 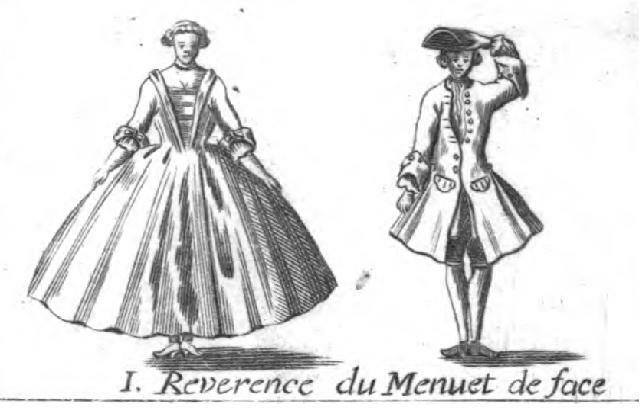 About 1769 Dubois published an interesting dance called Nouveau Mênuet de l’eloge de la Chasse. It came among the lots of cotillion type country dances and uses the same notation system. The description is not very detailed, and there are problems, so what you are about to experience, is really a re-creation. There is even a fragmentary second source to throw light on this unusual dance. One of the most important minuets of the dance history is Gardel’s Menuet de la cour, published 1781. This is a very satisfying choreography, which had an impact on stage minuets during the 19th century. In the Danish national play Elverhöi from 1828, there is a ballroom scene with a beautiful minuet for 32 dancers. The dance was choreographed by the otherwise less known dancer Poul Funck, and it is an interesting arrangement of the standard minuet of the day described by Jørgen Gad Lund in 1823. If we have time, we may even try a neo-classical minuet from around 1900 ….